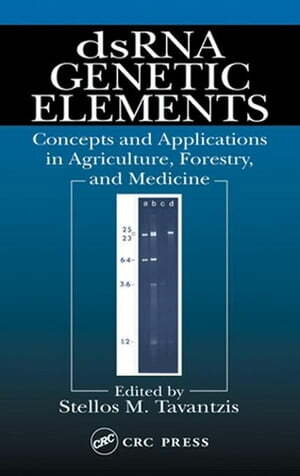 Collins Booksellers - dsRNA Genetic Elements: Concepts and Applications in Agriculture, Forestry, and Medicine by Tavantzis, Stellos M., 9781420039122. Buy this book online. Our understanding of the nature, origin, and biological roles of double-stranded RNA found in fungi, plants, and animals has advanced greatly during the last five years. Because these genetic elements are capable of replication, they can be used to manage fungal diseases of crops, vegetables, turfgrass, fruit, and forest trees using genetic means rather than by environmentally hazardous chemicals. And recent evidence suggests that the presence of small amounts of dsRNA elicits sequence-specific gene silencing, which may lead to the development of treatments aimed at silencing harmful genes causing serious diseases in animals and humans. dsRNA Genetic Elements: Concepts and Applications in Agriculture, Forestry, and Medicine compiles and unifies current knowledge of dsRNA genetic factors from different biological systems and discusses high-impact applications to agriculture, forestry, and medicine. It is a compilation of the latest advances on dsRNA systems from yeast, filamentous fungi, plants, and animals. This authoritative text is a valuable source of knowledge for a diverse audience from many areas of biology including molecular biology, genetics, and virology, as well as from applied fields in agriculture, forestry, and pharmaceutics.